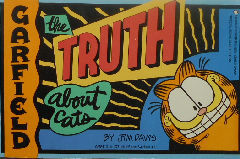 In this book Jim Davis uses Garfield cartoons to explain cat & their quirks (reaction to riding in cars, need for attention, rubbing against your leg, etc.). The paperback book is 5 1/4" high x 7 1/2" wide, approx. 58 pages (pages not numbered). Copyright 1991. Previously owned but in good condition.